Can Composite Bonding be Completed in One Visit? How Can I Replace in My Missing Teeth Without Implants or Dentures? Replace That Missing Tooth! What is a Cantilever Tooth Bridge? Lip Piercings – Why Do Dentist’s Have a Problem With This? Do Dentists Still Do Gold Crowns? What happens during composite bonding? Composite bonding can be completed in just one visit to improve a smile! Let’s say you have a job interview coming up and you want to look your very best. You don’t get a second chance to make a first impression and this interview is important to you! Your smile says a lot about you to others. 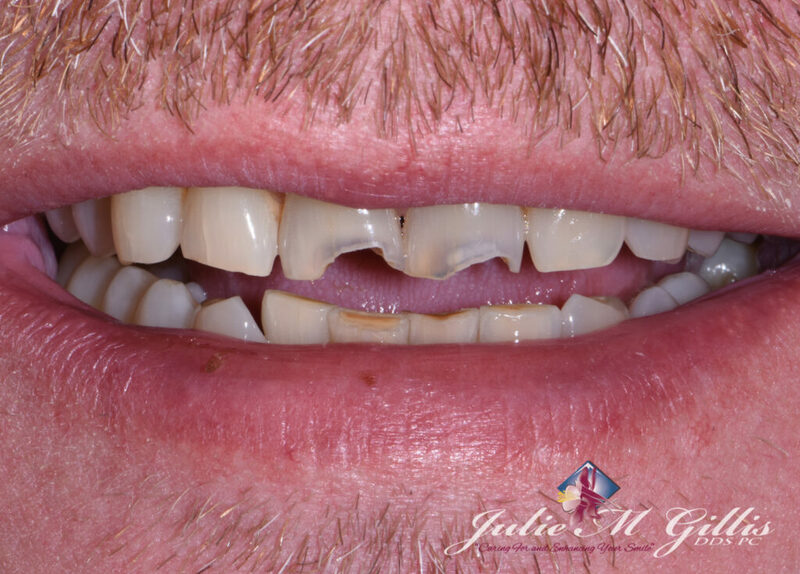 You may have gotten used to the chipping, decay, and staining of your front teeth just like our patient here. Although you no longer notice these problems with your front teeth, someone interviewing you for a job will likely notice this right away! Surveys have shown the importance of a nice smile. Fair or unfair, some people may even think you are smarter just because your smile looks good. Go ahead, take a new look at your smile and see if it says the right things about you. Even if you are not dealing with the public in your job, it can still be an advantage to have a nice, healthy looking smile. 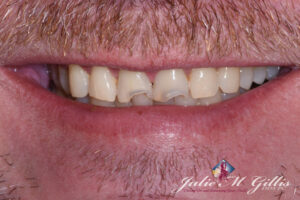 The chipped, dark, and uneven edges of the front teeth are probably the first things you notice about this smile! Direct composite bonding was completed in less than an hour (including the examination and discussion!) to reveal a much more attractive, winning smile. Your smile is very important during a job interview. Don’t let your teeth get in the way of getting the job you want! 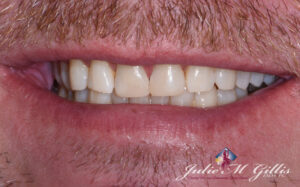 To create this smile transformation, Dr. Julie Gillis used polishers to remove the decay and loose enamel. Because the teeth were not sensitive, this whole procedure was done without anesthetic. That way the patient could leave the office ready to eat and smile and talk normally without feeling awkward. Although many people would be comfortable without anesthetic (shots! ), the use of anesthetic is always as needed for your complete comfort. Not everyone would be totally comfortable doing a procedure like this without anesthetic. The surface of the teeth was roughened slightly for better bonding, and composite (basically porcelain and resin) was carefully layered onto the teeth to replicate the missing tooth structure. Different colors and types of composite material were used to be able to block out the fracture lines and conserve healthy tooth structure. We hope our patient was successful in his job interview! Future blogs will feature how to take care of composite bonding so that it lasts as long as possible!